Stay 2 nights and play 3 rounds of golf on the Clyde Coast from only £175 per person! Play three ‘hidden gem’ Scottish golf courses, all designed by the world renowned architect James Braid, along the scenic Clyde Coast on the West Coast of Scotland. We’ve put together a Clyde Coast Golf Package offering 2 nights Bed and Breakfast along with 3 days golfing at different courses for between £175 and £250 per person*. Play one round of golf each day at Gourock Golf Club, Greenock Golf Club and Skelmorlie Golf Club – against stunning backdrops and views of the River Clyde and Argyll Hills. After an enjoyable day on each course, warm and welcoming Scottish hospitality will await at our accommodation partners – Belle Vue B&B, Foresters Guest House and The Spinnaker Hotel. Extend and enhance your stay by enjoying many nearby attractions that we are fortunate to have within easy reach from the Clyde Coast. Quality restaurants, outdoor heated swimming pool, plenty of nature and heritage walking trails, Scottish castles, boating trips are just a few activities to add into your trip. 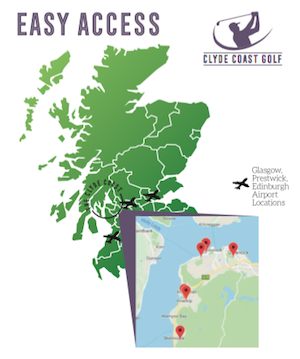 The Clyde Coast offers quick and easy access to the Scottish Highlands and “Burns Country”, as well as being 40 minutes drive from the vibrant city of Glasgow and 90 minutes from the historic city of Edinburgh. Transportation can also be arranged at additional costs, and if required, we can also incorporate other activities for non-golfers or those simply looking to incorporate a variety of activities – subject to additional charges. Our Clyde Coast Packages offer you a guaranteed trip to remember for golfing couples, family groups and larger golfing parties – with a whole host of local activities and attractions for the non-golfer. *Please note prices are quotes in British Pounds Sterling and include VAT. Prices can be variable throughout the season.